Mark your calendars for our first Spring Job Fair on Sunday, April 14th! Year-Round & Summer Positions are availabl! Please come prepared with availability and your start date! 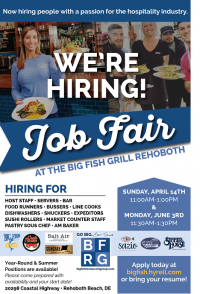 Apply today at bigfish.hyrell.com or bring your resume!